Married readers who was more excited about the name change you or your spouse? I’d love to hear your stories. Yesterday I started on my journey from Miss. to Mrs. (legally)! 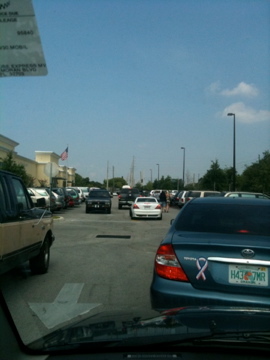 First stop the Social Security office in Lake Mary! Let me tell you I got up super, duper early – 6:30, went out for a 45 min. run, fixed Bernard’s lunch (yes, I do that), showered, and headed over to Lake Mary. 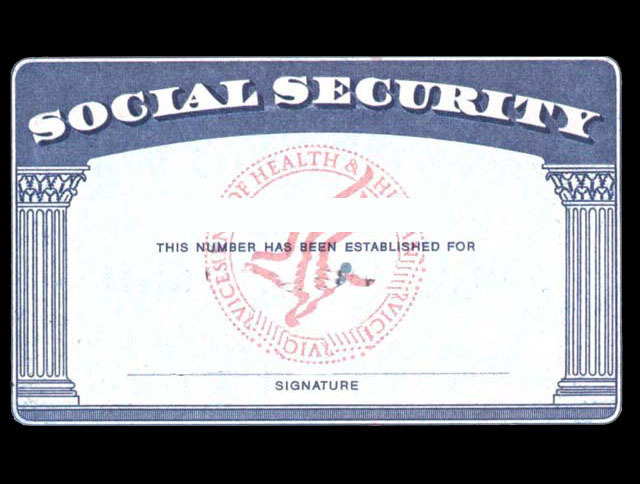 When I arrived the security guard (yes they have them at the SS office) informs me that the Lake Mary office does not handle Social Security cards – like what? But, it’s the SS office(mouth twisted up and head cocked to the side), they should handle everything SS related, Right? He say’s no. This office only handle SS benefits. Well, I’ll-be-darn. that’s not what it said on the SSA website. Then again I knew I should have doubted the information on the website. For one, I found several misspelled words (for example, here if you scroll do to Local agencies they “forgot” the ‘s’ in agencies). I look around and I assume he is correct, being that almost everyone in the waiting room is over the age of 65. Then he tells me that I have to go to the Orlando office, which is out near the airport (long sigh and a frown…it’s 30 min away). I decided to wait until Tuesday to make the trip down to Orlando office, being that I still had several items on my list I had to check off for the upcoming reception on Saturday. 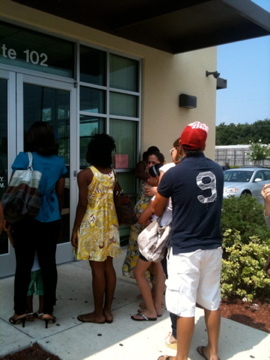 I'm finally inside...look at the line outside! 1. Don’t lose you SS card. Guard it with your life. Lock in a safe deposit and throw away the key. 2. Maybe at birth the federal government should just tattoo our SSN on our arms, that would eliminate a lot of the congestion at the SS office. 3. I’m not a fan of waiting in the sun at the SS office, or ANY government office for that matter. 4. It only took me 2.5 hours to see someone for 2.5 minutes. 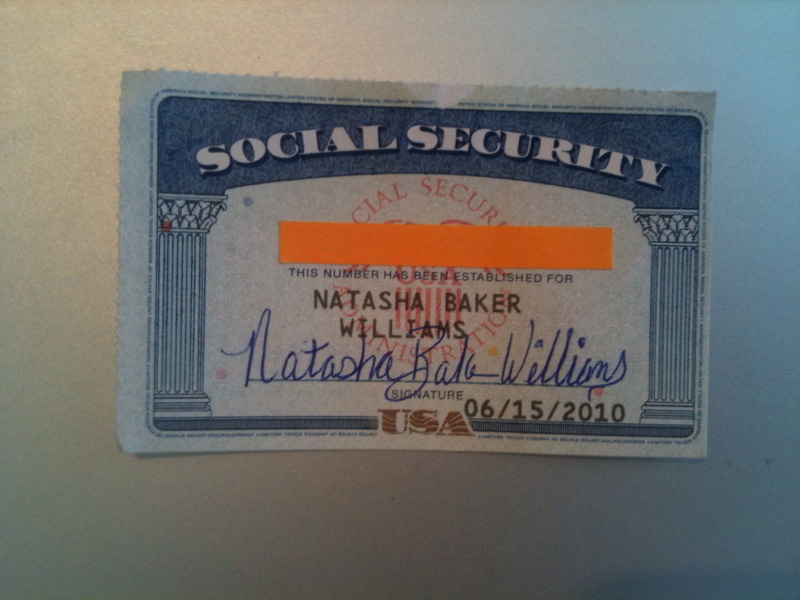 I have to wait 2.5 weeks to get my SS card that reads Natasha Williams!! Dr. B and I spent over an hour trying to figure out how to start the process of changing my name. After several Google searches, we found that it all begins with the Social Security Administration, since that government agency needs your correct name and ID number for payroll tax withholdings and retirement benefits. Also, a new Social Security card with your new name can make things easier as you move down the name-change list. So tomorrow I will head out to he local Lake Mary office to apply for my new card. After 10 to 14 days I will receive my new card, then I can go to the DMV and the passport office. From there I can go about changing my bank account and other smaller accounts. I couldn’t believe it was so hard to find this basic information. I guess that’s why there are several companies such as, MissNowMrs.com that sell name change kits for $29.95. Even after the charade Dr. B and I went through, I don’t believe those kits are worthwhile. Most of the government agencies provide name change forms and will complete the process for free. There is no need for a notification letter, which is basically what the a name change kit provides. They are really just taking advantage of the initial confusion surrounding of the process. 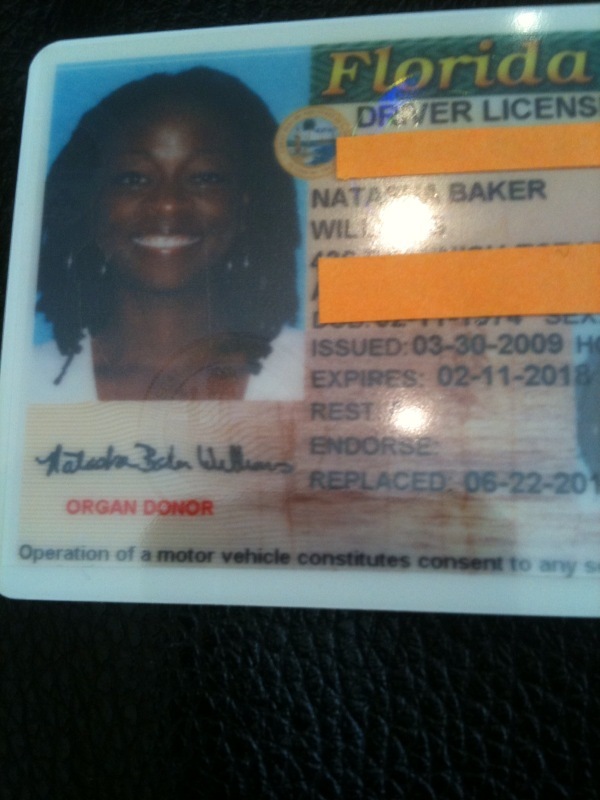 So, if all goes well, in about a month (fingers crossed), I should “officially” Natasha Baker Williams…wish me luck. 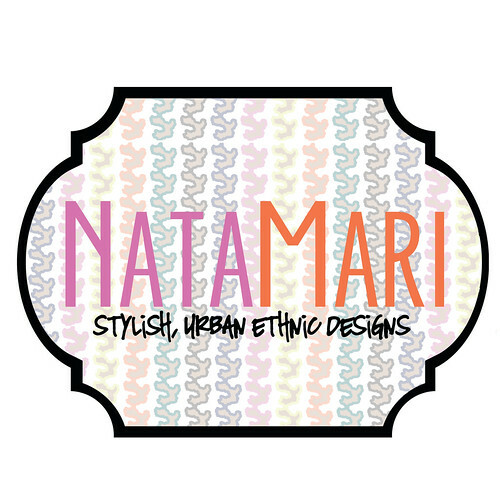 Married ladies, I would love to hear your name change horror stories! On Monday Bernard ordered our marriage certificate from the Clark County Clerk of Courts. Once received, I can go about the business of officially changing my name, ie. passport, driver’s license, bank accounts, etc… Up until a month ago, I didn’t think twice about changing my last name. But then I read these posts, On Name Changing and Weddings Part I and Part II, over on the A Practical Wedding (APW) blog, and I suddenly had a slight dilemma – did I really want to change my name? I’m not a big fan of hyphenating (no offense to women who have hyphenated their names), but I do love being a Baker. And I didn’t want to lose that part of me. I’ve been Natasha M. Baker for 36 years. I really like my name, and to have to stop on a dime and change it, is honestly, a bit scary. Somewhat akin to leaving a piece of yourself behind. But, at the same time, I am somewhat of a traditionalist and I do believe in the woman changing your name after marriage. For me it shows respect for my husband and for the institution of marriage. One of the readers on APW commented that she did not feel that she was “changing” her name but adding to it….adding her husband to herself. That is when I had my ah ha moment. I not leaving behind the 36 years of Natasha M. Baker, but I am adding a fabulously wonderful, caring and loving man to my life. As the bible says, “and the two become one.” I discussed this with Dr. B and he totally understood my feelings. He would love for me to take his name, but he will also support me in whatever I decide to do. So, I without a doubt am taking Dr. B’s last name, but I am dropping my middle name and changing it to Baker. So my new name will be Natasha Baker Williams- sans the hyphen. Keeping my last name as my middle name is a slight modification, but one that just works for me and my husband, and that’s really all that matters. So I ask, what’s your take on the name change options for women?